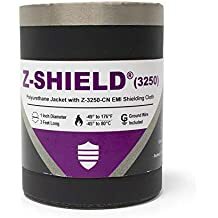 Shrink N Shield 4_1 - Shrink N Shield - Trade Names - ZT | Zippertubing Co.
Shrink-N-Shield (4:1) combines two proven technologies in a single, easy to install product for adding EMI shield protection to wire and cable bundles with diameters of 1/2" and less. 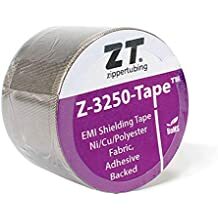 This product is comprised of our over expanded MIL-I-23053/5 heat shrink tubing and Zippertubing's Z-3250-CN conductive cloth which has outstanding shielding properties. The over expanded tubing has a 4:1 shrink ratio which makes installation over pre-installed connectors and cable end hardware possible without complete dis-assembly. Makes adding an EMI shield or secondary EMI shielding to pre-installed wire and cable a snap. The product has an operational temperature range of -45 to 135°C. This product is supplied in four foot long sticks. Diameter Before Shrinkage 0.75" 1.0" 1.5" 2.0"